The kitchen sponge - that one that you scrub your dishes with - can be one of the germiest things in your house, unless you take steps to clean it properly. I recently had a chance to try a new type of scrubber from DishFish. It's made with PowerCell Technology that resists bacteria. It's designed to last twice as long as a typical sponge without falling apart. I love the shape - the curves helped it fit in my hand better than a rectangular sponge would. I also really love the "gills" that make it easy to wash utensils without folding the scrubber over. 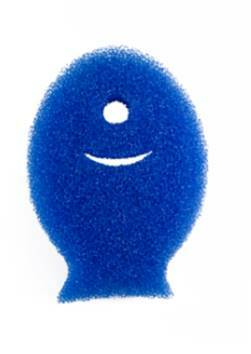 There are two kinds, the classic scrubber and the dual that has scrubber and more spongey texture in one. The DishFish is scratch-free, and worked well on all of the dishes I tried without damaging them. You can find Dish Fish at a variety of retailers, including Amazon, Piggly Wiggly, Country Market, and more.